While the Eurosceptic Danish People’s Party could become the biggest party in Denmark’s European Parliament elections, its Swedish sister party, the Sweden Democrats, is struggling to mobilise voters, according to polls. Sweden’s Parliament election is likely to be an indicator of which parties will win the general elections on 14 September. According to a poll published by Dagens Nyheter, the current centre-right governing parties will be punished by voters. The Social Democrats, will become the biggest party. The Social Democrats are set to get 30.7% of the votes on Sunday, up from 24.4% in 2009. Other centre-left opposition parties, such as the the Left Party and the Environment Party, are projected to be winning seats, as well. While Prime Minister Fredrik Reinfeldt’s conservative party, the Moderates (at 22.8% according to polls), is likely to gain an extra seat, the other centre-right government parties, the liberal People’s Party and social-liberal Centre Party, are losing seats and are at risk of exiting the European Parliament. At the same time, the Eurosceptic, right-wing party the Sweden Democrats (SD), which is the third biggest party in national elections, is struggling to mobilise voters and, as opposed to the general tendency in this year’s EU elections, are at risk of not winning any seats. Party leader, Jimmie Åkesson has encouraged SD voters to ‘step up’ on Sunday as a bad election will create a negative sentiment just before launching the next campaign, aimed at the general elections. The problem the Sweden Democrats are facing is that for the average Sweden Democrat voter, EU opposition is not why they vote for them, but because they want a different immigration policy, according to Ulf Bjereld, a professor of political science at Gothenburg University. Meanwhile in Denmark, the Eurosceptic Danish People’s Party, is currently ahead in the polls at 25.1%, winning two seats, followed by the Liberals (22.4%) and the Social Democrats (21.2%). The Conservatives, part of the European People’s Party (EPP) group, could likely lose their only seat, while the Green Party looks to be keeping the one they have. The Danish People’s Party has looked to Britain’s UKIP for inspiration, calling for less EU influence over Danish matters, an end to ‘benefits tourism’ and tougher border controls. 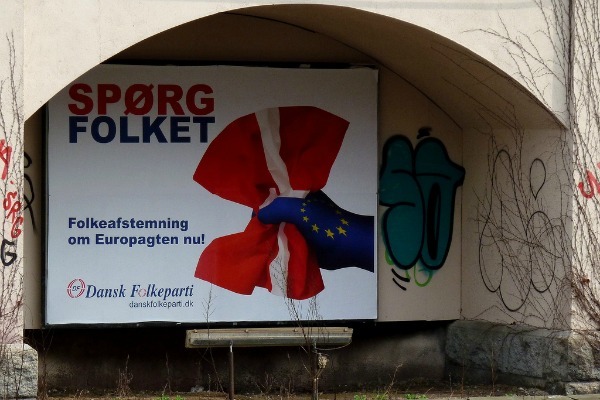 On Monday (19 May), several Danish business organisations warned against voting for the Danish People’s Party, because for the last five years, the party has been part of the Europe of Freedom and Democracy group, and therefore had been “without real influence”. The Danish People’s Party MEPs have responded by saying they will try to seek influence by moving to the European Conservatives and Reformists (ECR) group, which, for the most part, is made up by British conservatives. Jørn Neergaard Larsen, the CEO of the Confederation of Danish Employers (DA), also told EURACTIV in an interview that the election campaign in Denmark this year has become ‘worse’, with a lot of political debates on benefits tourism which haven’t been fact-based. However, political experts said that these kinds of public warnings against voting for specific parties are likely to backfire among voters. Election polls show that around 50% of voters are still undecided, making the forecasts in this year’s election more difficult than ever. In a separate EU referendum on Sunday, Danish voters will vote on whether to join the EU’s new patent court. A common European court is expected to make patent applications easier and cheaper within the EU, as companies would only have to file in just one place, instead of several European countries. While 47% of the voters are expected to vote ‘yes’ and 18% against, according to a poll by Epinion, 31% of the voters are still undecided. On 22-25 May, all 28 EU member states will hold elections for the European Parliament. Across Europe, parties are gearing up to go head-to-head on unemployment, euroscepticism and the future of the European Union. 25 May: European Parliament elections in Denmark and Sweden. 14 Sept.: General elections in Sweden.